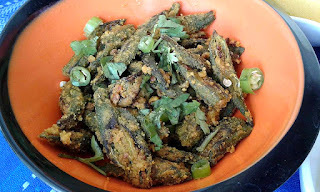 Bhindi or Okra is one of the most versatile vegetables. Available throughout the year and easy to prepare, it is omnipresent in our lunch/dinner menu. From a plain stir fried version to a more dressy stuffed one and even as a sweet-sour gravy, we love it in all forms. But during fasting days, I get into a quandary as most of our odia recipes use garlic along with Bhindi. That's one of the reasons why I am always on the lookout for 'no onion no garlic' recipes. Surfing through the net, I chanced upon this easy fried Okra recipe by Sanjeev Kapoor. The fragrant chick peas flour and spices coat the okra and form a thick layer of powdery deliciousness over the crisp veggies. It was a hit with the family and I ended up making it three times within the span of five days. Preparation - Cut the okra into diagonal pieces. Cooking - Heat the oil in a nonstick skillet. Add the okra and fry till crisp. Remove and keep aside. In the same skillet, add the ghee. Add the besan and fry till fragrant. Add the coriander, amchur, chili powder, turmeric and garam masala. Fry for 30 seconds. Add the okra, sprinkle a few teaspoons of water and fry till the vegetables are evenly coated. Remove from the skillet. Garnish with lemon juice and chopped cilantro.